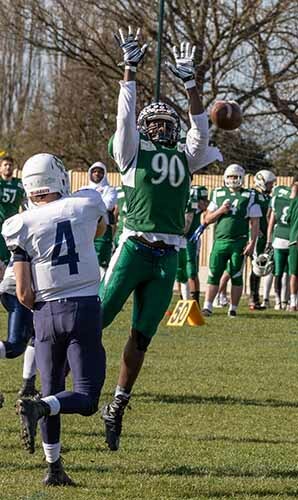 Leicester Falcons began their preseason with a convincing 68-6 win over Oxford Saints. The Falcons have made a number of new acquisitions since promotion to the Premier Division, and on the strength of today, should be able to compete in the top tier. The Falcons debuted their new ‘air raid’ offence, inspired by their American Collegiate partners Baker University, and it was their ex-Baker stars that took centre stage, chiefly receiver Quanzee Johnson who recorded a hat-trick of touchdowns. New quarterback Logan Bretell took the reins of the offence and scored on every first half drive. Bretell connected deep with Johnson on the first drive, before hitting home-grown receiver Danny Burton for his second. The new Falcons offence is built around quick passes and few runs, running just once in the first half, and Oxford, a division below the Falcons, struggled to match the pace. Another new Baker acquisition, Clarence Clark, was on hand with two touchdowns of his own, before Johnson completed his hattrick just after the break. 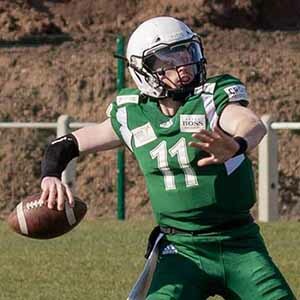 In the second half Bretell made way for University of Leicester quarterback Ted Watts, and Watts responded with touchdown passes of his own to another new acquisition, Nate Melero. Last season’s leading rusher Marcus Francis proved the Falcons could still run the ball, going over from short yardage, and defence got in on the act through a long interception return from star safety Taylor Brown. Oxford were able to move the ball but committed costly turnovers in the red zone, before finally scoring in the final quarter. The Falcons take on Wembley Stallions this Saturday in another preseason game before the Premier season starts on April 14th against Sheffield Giants. Pre-game, the Falcons were visited by NFL player Deshaun Watson. The Houston Texans quarterback was in town to film a documentary for US television on Gridiron around the world, and put on a passing clinic with guests from the Falcons, Saints, GB Lions and other invited guests.